The ‘Runa-vimOchana Lingam’ is installed in a separate sannadhi. The Lord is worshipped with the firm belief that he absolves the devotees of all their debts, in whatever form it may be on them. The debt may or may not be monetary and is not limited to that alone. It is believed that the Lord helps those who worship him for 11 Mondays observing the prescribed rituals, to tide over many a difficulty in their lives - like delays and hindrances in getting married, or being blessed with a child, or settling down in life in a good profession, debts related to business and also in development of business. Markandeya is believed to have installed a Lingam here and worshipped the same. His prayer for prosperity of the people of this region was answered. 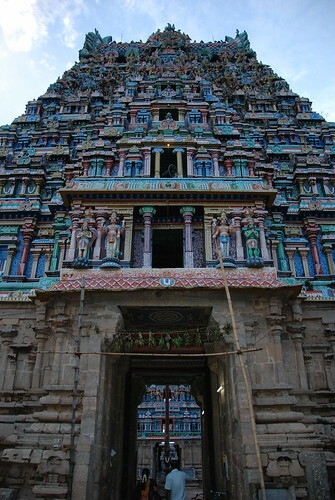 The Rinavimochaneswarar Lingam is in the outer praharam (Circumambulatory path). The general belief is that worshipping Lord Shiva here helps improve the financial status and be debt-free. It is just the superficial meaning. However there is a deeper meaning to this. Debt includes financial debts and not limited to it. There are other debts that many of us may not be aware of. According to scriptures, every human being is born with three types of debts. They are Deva rina (debt to God), Rishi rina (debt to Sages or Rishis) and Pitru rina (debt to ones ancestors). There are also well-defined means of repaying these debts. If a man does not repay these debts in his lifetime he will have another birth to repay. There is no escape from repaying these debts. There are fairly a large number of people that take part in this worship ritual. During this ritual, a priest recites the Dharidriya Dhahana Shiva Stotram over a public address system and the devotees are encouraged to repeat after him. Thus worshipping at this temple absolves us of the three debts viz Deva Rina, Rishi Rina and Pitru Rina, apart from being blessed with prosperity. Reciting the Dharidriya Dhahana Shiva Stotram thrice a day also is said to yield the same benefits. After worshipping Rinavimochanar, pray to Mahalakshmi whose shrine is near the Rinavimochanar shrine. After this proceed to Jeshtadevi’s shrine and worship Her. She ensures that you stay debt-free for the rest of your life. Archana to Bhairavar on eight consecutive ashtami (eighth day from New moon or full moon) and Abhishegam (ablution) is performed on the ninth ashtami. Devotees following this procedure are blessed with success in their endeavours and victory in any litigation. Bhairavar also blesses them by removing the navagraha dosha (malefic effect caused by a planet which is in an unfavourable position in ones horoscope).